Incorporate our Berlin Gardens Poly Comfo-Back Glider for Two into your outdoor space and enjoy hours of carefree gliding that will leave you felling relaxed and rejuvenated. Available in an array of striking poly colors and our optional Sunbrella cushions and throw pillows, there's no doubt that you will the perfect gliding bench to fit seamlessly into your unique outdoor decor! Add our Allochrome Glider Brackets for areas with salty, damp or long winter conditions to ensure your glider's brackets will have an extra layer of protection when facing the elements. As a new standard in outdoor furniture, maintenance-free poly is the perfect investment in your own personal outdoor oasis. Each piece of our poly furniture is made in America by skilled Amish craftsmen. 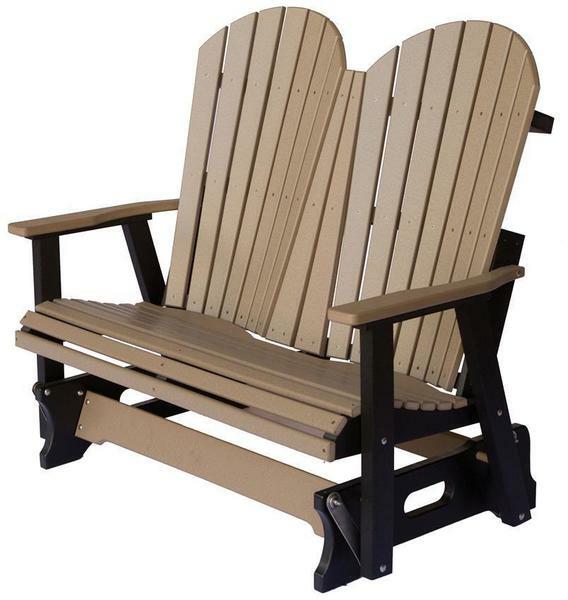 Because of this, you will receive a piece of outdoor furniture that will withstand the elements and is also constructed to withstand decades of continued use. Invest with confidence knowing you Berlin Gardens Comfo-Back Glider Bench is backed by a twenty year warranty for residential use and DutchCrafters is backed by a A+ rating from the Better Business Bureau! Just a note to let you know we received the table today and so my order is complete. 😊. As I mentioned earlier we really do love it! It looks great, is very sturdy, and at the same time is very comfortable. I would like to commend everyone who had anything to do with our order. You were always so prompt in getting back to me and answering any questions I had from beginning to end. You even went a step further to inform me that the side table I ordered last was from another company and wasn't the exact color match that I might have been expecting. You were so good about everything and I Really appreciate your kindness and understanding through it all, even making sure we received the order before we were due to go away. Can't say enough nice things about the company you work for and its "top quality"
Employees! Please pass these compliments on to whomever you wish. I will definitely order from you again and will be happy to recommend Dutchcrafters to others! We here at the 577 Foundation very much enjoy the Daisy tables and chairs. Also the gliders. It is such a well built product, great workmanship. The service from JMX out of Florida was very helpful. We tell everyone where we got the polywood patio furniture. Thank you very much!